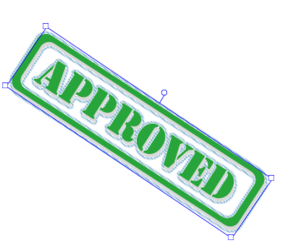 Q: I created a standard stamp “Approved” in jPDFNotes. After I opened the PDF AND rotated the stamp in Adobe Reader DC, the rubber stamp changed to a black X. Note that resizing works well, this only happens when rotating. A: Qoppa PDF engine follows the specifications for the standard business rubber stamps names. Approved, Experimental,NotApproved, AsIs, Expired, NotForPublicRelease, Confidential, Final, Sold, Departmental, ForComment, TopSecret, Draft, ForPublicRelease. Additional names may be supported as well. Default value: Draft. The annotation dictionary’s AP entry, if present, shall take precedence over the Name entry; see Table 168, “– Entries in an appearance dictionary” and 12.5.5, “Appearance streams”. If the IT key is present and its value is not Stamp, this Name key shall not be present. It seems that Adobe recreates the appearance stream when the stamp is rotated, which it does not really need to, it could just add a rotation transform to it. If there is a name entry in the name dictionary, it tries to find a matching stamp among the standard predefined stamps saved in their installation directory. 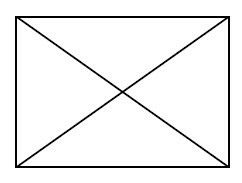 If a matching stamp is found, it uses it to recreate the appearance stream, otherwise, they draw an ‘X’. Where can I find the Standard Business Stamps used by Adobe? They are contained in a PDF file called “StandardBusiness.pdf”. 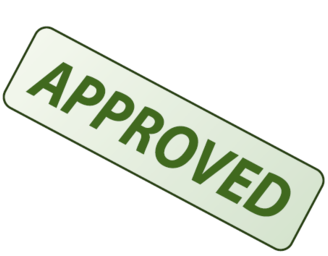 Adobe Acrobat comes packaged with both standard business stamps named “Approved” or “SBApproved”. Their appearance streams is slightly different. See below. Adobe Acrobat Reader DC only comes with stamps named “SBApproved”, “SBExperimental”, etc… which is contradicting the PDF specifications. // Use "SBApproved" to be compatible with both Adobe Reader DC and Adobe Acrobat.